Artist's representation of Yanocondon allini, a Mesozoic mammal fossil found in China. Yanoconodon allini gen. et sp. nov.
Etymology. Yan is for the Yan mountains in Northern Hebei Province; conodon is Latin for 'cuspate tooth', a common suffix for mammalian taxonomic names; allini refers to Edgar Allin's studies on mammalian ear evolution. Holotype. Nanjing University - Paleontology Laboratory NJU-P 06001, preserved on a slab (NJU-P06001A, shown in Fig. 1) and counter-slab (NJU-P06001B, shown in the Supplementary Information) of laminated siltstones. Figure 2: Relationship of Yanoconodon allini. Analysis of all dental and skeletal characters of Yanoconodon places it as a close relative of Jeholodens, in the Jeholodentidae among eutriconodontans. This artistic reconstruction shows Jeholodens jenkinsi, a triconodont mammal that lived about 120 to 140 million years ago during the Mesozoic. The animal has three cusps on its teeth and fed on insects and aquatic arthropods. 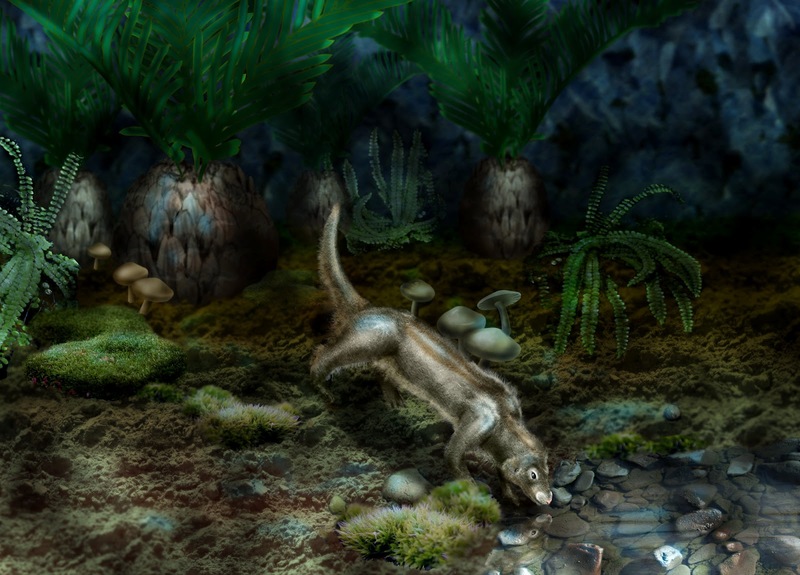 It lived near a shallow fresh water lake and co-existed with a very rich fauna of fish, amphibians, feathered dinosaurs, birds, and lizards, plus very abundant plants and insects. 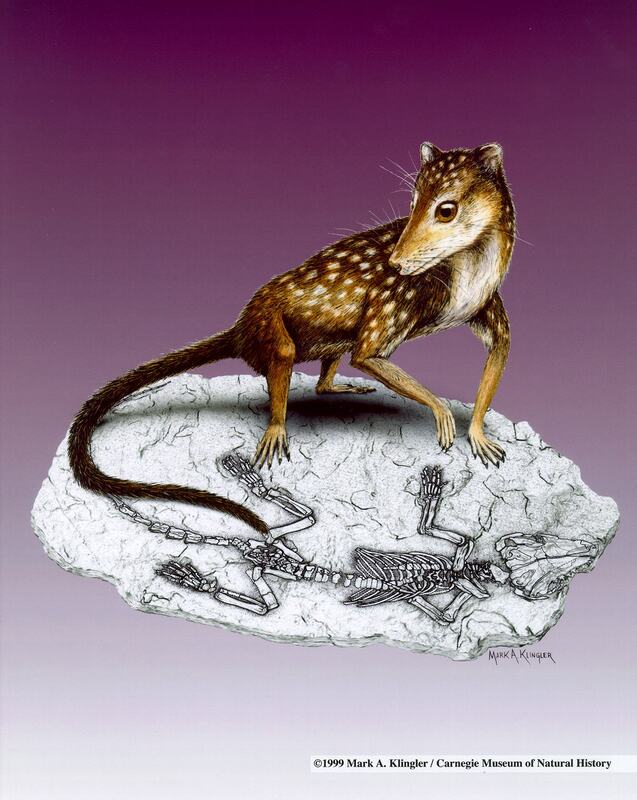 Its sprawling hind legs and pelvis had a reptilian posture, yet its forearms and shoulders were more flexible. 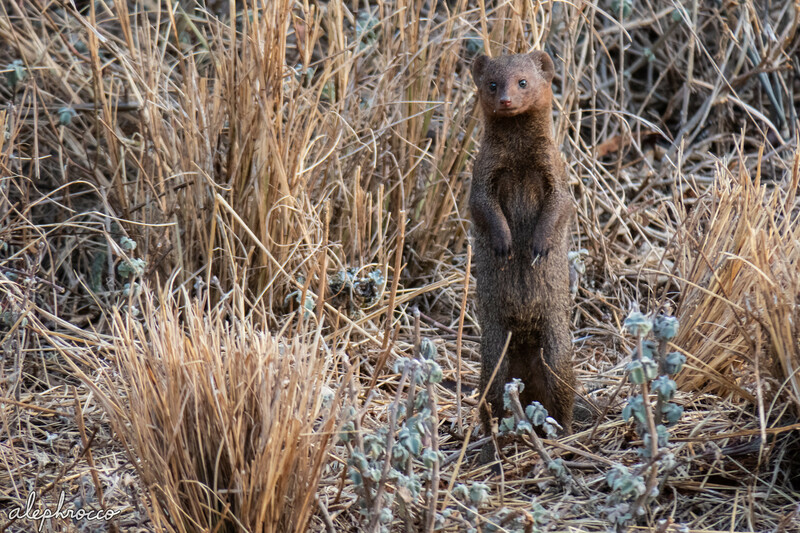 The animal is a ground-living mammal, suggesting that mammals probably originated from ground (instead of tree) habitat. The reconstruction shows how the animal would look in life, in contrast to the fossil skeleton of the same specimen preserved in the sedimentary rock. Jeholodens jenkinsi gen. et sp. nov.
Etymology. 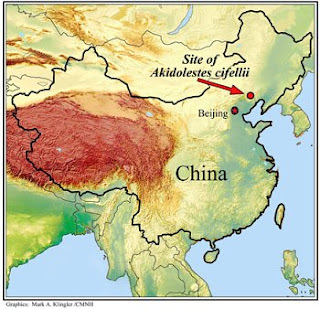 Jehol: an ancient geographic name for the western part of the Liaoning Province, China; the namesake of the Jehol fauna in the Yixian Formation that yielded the holotype; odens (Latin): tooth; jenkinsi (Latin): in honour of F. A. Jenkins Jr for his pioneer studies of the evolutionary morphology of the mammalian postcranial skeleton. Holotype. GMV 2139 a, b, a nearly complete skeleton consisting of a partial skull and all of the postcranial skeleton preserved as two counterparts (Fig. 1a; a reconstruction of the specimen is shown in Fig. 1b). FIGURE 1. 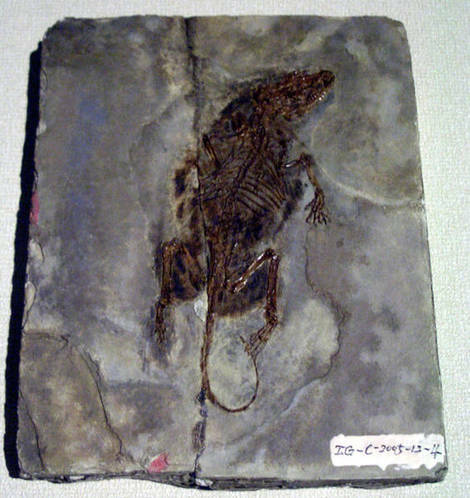 Jeholodens jenkinsi (National Geological Museum of China, holotype GMV 2139a). 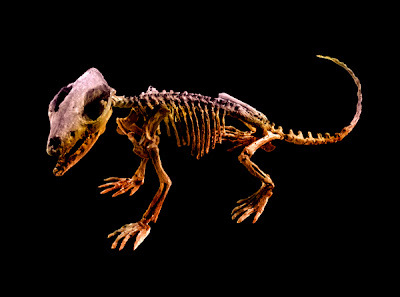 a, Dorsal view of the dorsoventrally compressed skeleton. b, Reconstruction of J.jenkinsi as a ground-dwelling animal that had a plantigrade gait, sprawling hindlimbs and a mobile pectoral girdle with relatively wide range of excursion of the scapula but a sprawling elbow. 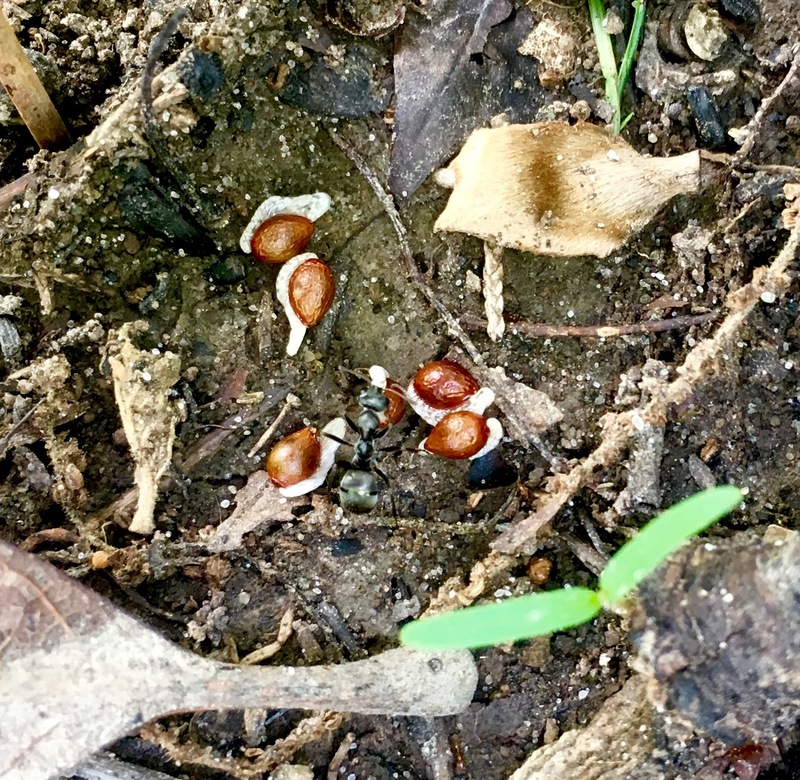 A newly discovered Jurassic mammal is seen here in an artist's depiction foraging among fallen ginkgo leaves and arthropod shells (top). Based on the size and shape of the skeleton (bottom), scientists believe the 4.7-inch-long (12-centimeter-long) creature was a powerful digger that ate plants and insects. The animal's teeth could both cut and grind, showing that the key dental adaptation evolved separately at least twice in the history of mammals, the researchers add. Pseudotribos robustus gen. et sp. nov.
Etymology. Pseudo, false, for superficial resemblance; tribos, grinding, for the grinding and crushing function of the pseudo-tribosphenic molar; robustus, strong, for the stout limb bones of the new mammal. Holotype. 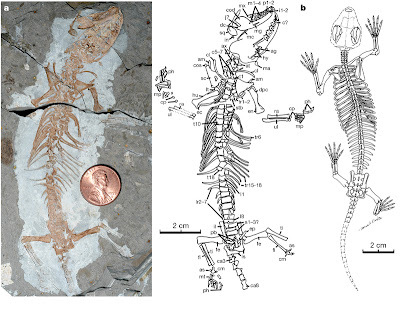 Chinese Academy of Geological Sciences (CAGS)040811A and CAGS040811B are the part and counterpart, respectively, of a partial skeleton with impression and carbonized residues of furs (Fig. 1). Zhe-Xi Luo, Qiang Ji, and Chong-Xi Yuan. 2007. Convergent dental adaptations in pseudo-tribosphenic and tribosphenic mammals. Nature 450 (7166): 93–97. doi:. 10.1038/nature06221. 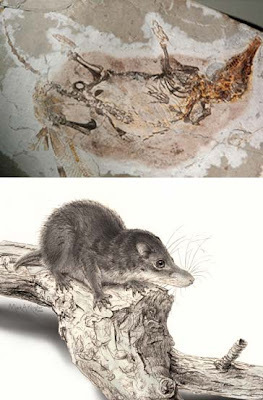 An artist's conception (bottom) depicts Akidolestes, a previously unknown species of mammal that lived alongside dinosaurs some 125 million years ago. A well-preserved fossil of the animal (top) was found in China, which researchers say strengthens the theory that the main mammal groups originated in Asia. Akidolestes cifellii gen. et sp. nov.
Holotype. 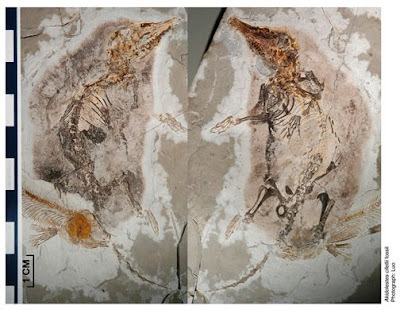 Nanjing Institute of Geology and Palaeontology, Nanjing, China (NIGPAS) 139381A, B (Fig. 1), a skeleton with partial skull and dentition preserved in part and counterpart. Etymology. 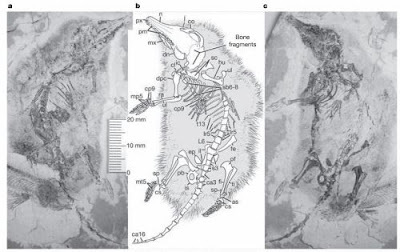 Akidolestes: akido- (Greek) for point, for the pointed rostrum of this new mammal; -lestes (Greek), for thief, a common suffix for the name of fossil mammals; cifellii, in honour of Richard L. Cifelli, for his pioneering studies of symmetrodont mammals. Locality, age and associated fauna. Yixian lacustrine beds at the Dawangzhangzi Locality, Lingyuan, Liaoning, China. The locality is correlated with other localities in Liaoning dated to be 124.6 Myr of the Barremian stage of the Lower Cretaceous, although there is no universal agreement on correlating the Yixian Formation to the European marine stages. 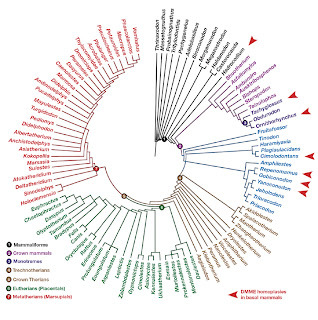 Other mammals of this formation include eutriconodontans, multituberculates, symmetrodonts, metatherians and eutherians. Li, G. and Z.-X. Luo. 2006. 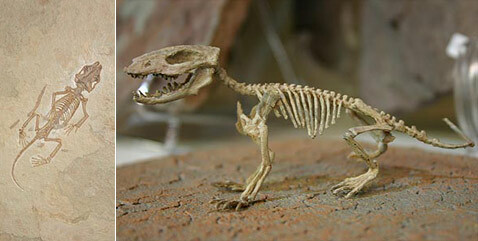 A Cretaceous symmetrodont therian with some monotreme-like postcranial features. Nature, 439:195-200. Symmetrodonts are Mesozoic mammals having lower molars with nearly symmetrical trigonids but lacking talonids. They appear to be stem members of the mammalian clade that led to extant tribosphenic mammals, but the fossil record of symmetrodonts is poor. 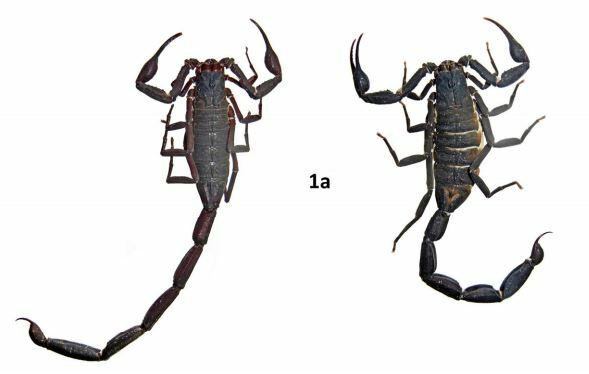 Here we report a new genus and species of an acute-angled spalacotheriid symmetrodont, Heishanlestes changi, n.gen. and n.sp., represented by well-preserved lower jaws with teeth from the Early Cretaceous of northeastern China. The new mammal has four tightly spaced premolars and three morphological groups of lower molars, in which the ﬁrst molar has an obtuse trigonid angle and the last two molars have a large neomorphic cusp in the center of the trigonid, a feature not seen in other mammals. Heishanlestes appears to be a specialized member of the spalacotheriid subfamily, Spalacolestinae, which is otherwise only known from North America. The animal probably used the premolars to crush its prey before shearing it with the molars. TYPE SPECIES: Heishanlestes changi, n.sp. ETYMOLOGY: ‘‘Heishan’’ is the name of the county in northeastern China in which the materials of the type species were collected. DISTRIBUTION AND AGE: As for the type and only species. 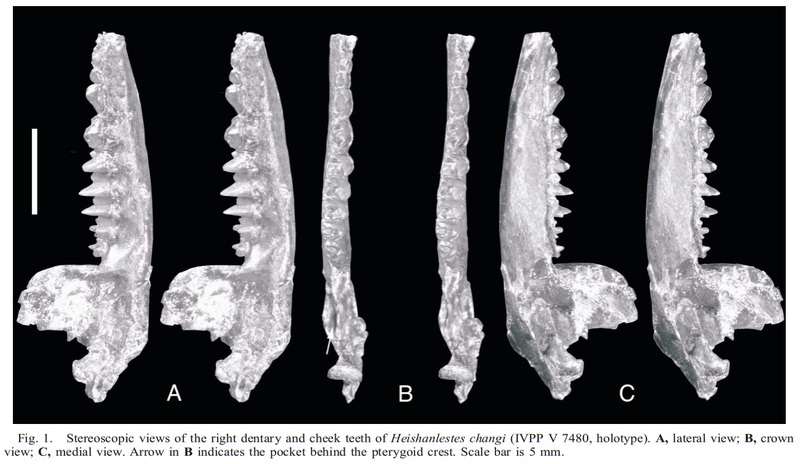 HOLOTYPE: IVPP V 7480, a nearly complete right dentary containing p1–4, m1–6 (ﬁgs. 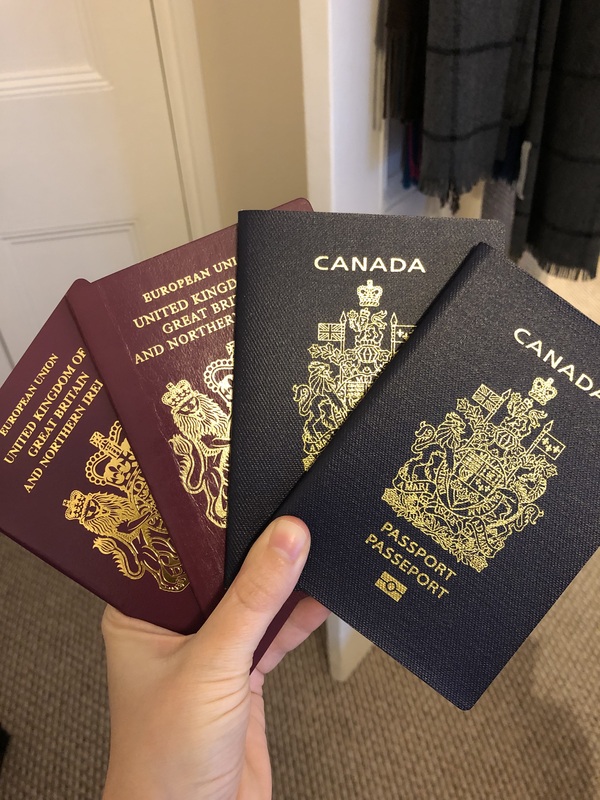 1, 3, 4, 5). REFERRED SPECIMENS: IVPP V 7481, anterior part of a left dentary containing an erupting canine, p1–4, m1 (ﬁgs. 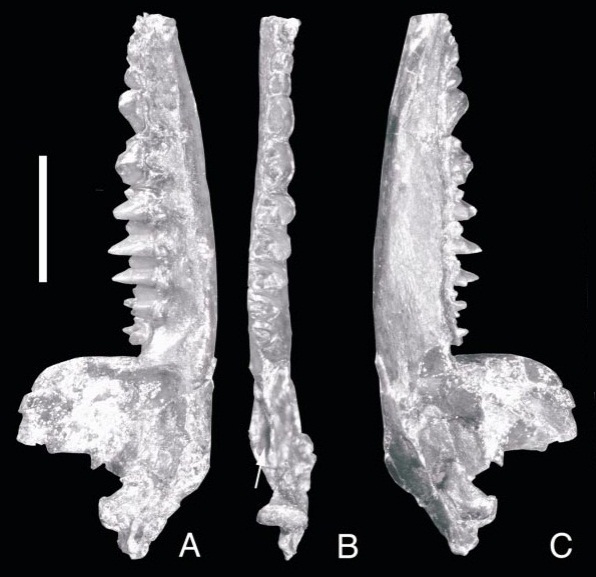 2, 3); IVPP V 7482, anterior part of a left dentary containing p4, m1, and alveolus for p3 (ﬁg. 2). ETYMOLOGY: ‘‘changi’’ is for Professor Zhenglu Chang, from Liaoning Technical University, for his important contribution to the study of Mesozoic stratigraphy and paleontology of northeastern China during the past 50 years. Fig. 2. Symmetrolestes parvus (NSM PV 20562, holotype). 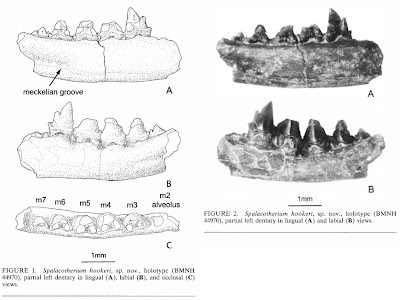 We describe a new spalacotheriid (acute−angled) “symmetrodont” (Mammalia, Trechnotheria), Symmetrolestes parvus gen. et sp. nov., from the Lower Cretaceous, likely Barremian, Kitadani Formation of the Tetori Group, central Japan. The specimen consists of a fragmentary right lower jaw with first incisor and five preserved postcanine teeth (interpreted as p5–m4). Symmetrolestes has acute−angled molariforms with complete shearing surfaces on the para− and protocristids, and relatively tall crowns, features that are referable to Spalacotheriidae. Symmetrolestes is more derived than zhangheotheriids in having complete shearing surfaces, taller crowns, and more complete cingulids. It differs from other spalacotheriids in having fewer molariforms (m1–4), higher number of premolariforms (p1–5), and gradual transition between premolariforms and molariforms. Our cladistic analysis of 29 characters shows Symmetrolestes as the sister group of the remaining Spalacotheriidae. This node is supported by only one character (Bremer support: 1) and therefore not particularly stable. The remaining spalacotheriids are arranged in a fully pectinated tree conforming to the topology of the previous researchers, in which Spalacolestinae occupy an apical position. The combination of the occurrences of a primitive spalacotheriid, Symmetrolestes, in Japan and of Zhangheotheriidae, which is the sister taxon of Spalacotheriidae, in China suggests a possibility for an East Asian origin of Spalacotheriidae, although it implies long ghost lineages for the latest Jurassic to Early Cretaceous East Asian “symmetrodonts”. Key words : Spalacotheriidae, “symmetrodonts”, Symmetrolestes, Early Cretaceous, Tetori Group, Japan. 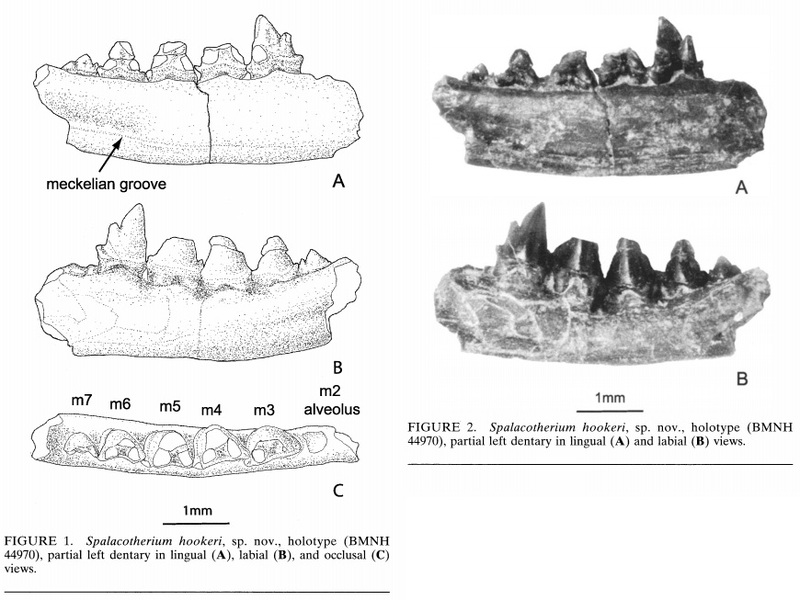 The “symmetrodont” mammal, Gobiotheriodon infinitus (Trofimov, 1980), from the Early Cretaceous (Aptian–Albian) of Mongolia, is redescribed.The species is restricted to the holotype only (dentary with three last molars), the referred maxillary fragment with M3? is considered here as cf. Gobiconodon sp.The dental formula of G. infinitusis reinterpreted as i1–3 c1 p1–3 m1–4. G. infinitus is characterized by a short dentary symphysis; long, well developed Meckel's groove; small, triangular−shaped pterygoid fossa; weakly developed pterygoid crest; i3 enlarged; p1–3 two-rooted; lower molars acute- to obtuse- angled, labial cingulids lacking, lingual cingulids very short, well developed mesial and distal cingulid cuspules (“e” and “d”) and prominent wear surface on the paracristid. Gobiotheriodon is similar to Tinodon (Late Jurassic, USA; Early Cretaceous, Great Britain and Portugal) in postcanine dental formula and structure of the pterygoid fossa; it is provisionally assigned to Tinodontidae Marsh, 1887.Some taxa previously assigned to (or suggested as possible relatives of) “Symmetrodonta” are reviewed. 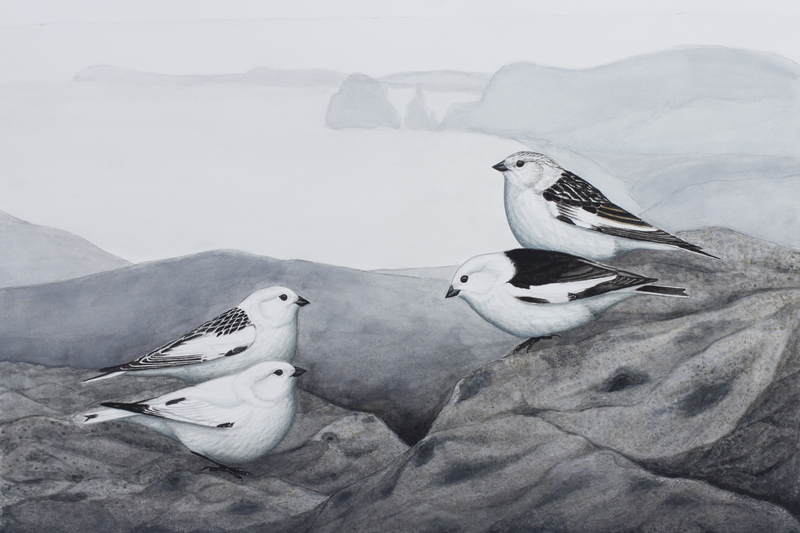 Amphidontidae Simpson, 1925 is considered as nomen dubium. A new classification for “Symmetrodonta” is proposed. K e y w o r d s : Gobiotheriodon, “Symmetrodonta”, systematics, Höövör, Mongolia, Early Cretaceous. Averianov, A.O.2002. 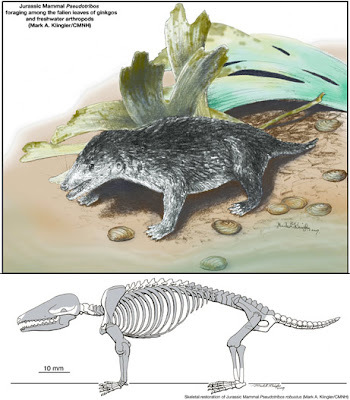 Early Cretaceous “symmetrodont” mammal Gobiotheriodon from Mongolia and the classification of “Symmetrodonta”. Acta Palaeontologica Polonica 47 (4): 705–716. 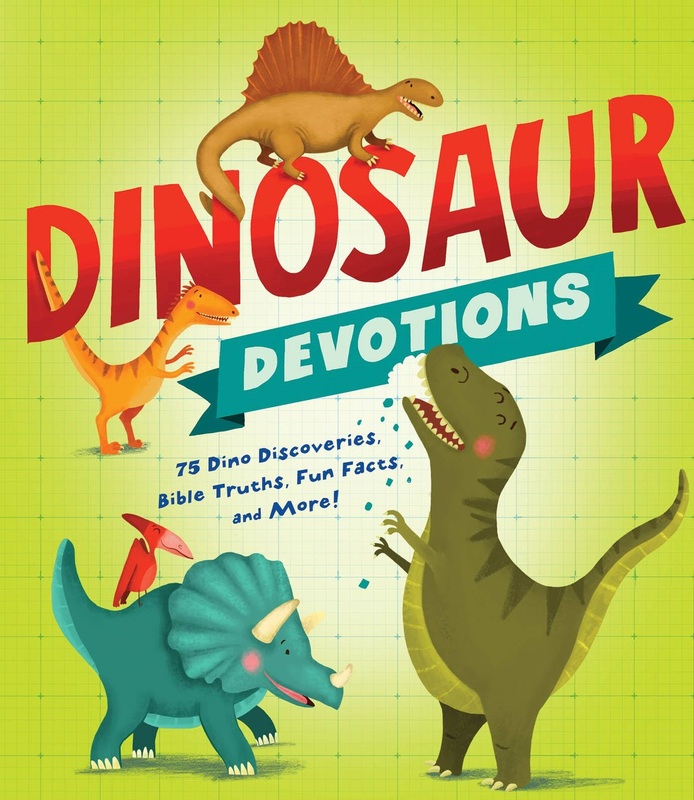 The fossil remains of this small animal from the age of the dinosaurs show that it shares features of both modern mammals and their reptilian relatives, and that it lived near a lake with a rich diversity of vertebrates, insects, and plants. 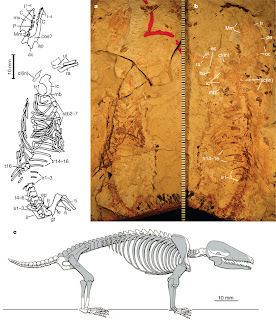 Figure 1: Zhangheotherium quinquecuspidens (IVPP V7466, holotype). for the three main cusps plus two large accessory cuspules on the lower molars. Locality. Jianshangou Valley (approximately 41° 41' 01" N, 120° 59' 30" E), about 32 km east of Chaoyang City, Liaoning Province, northeastern China1. Horizon. The Jianshangou Beds, consisting primarily of shales, are the lowest lacustrine intercalation in the neutro-basic volcanic beds of the Yixian Formation. Associated fauna. 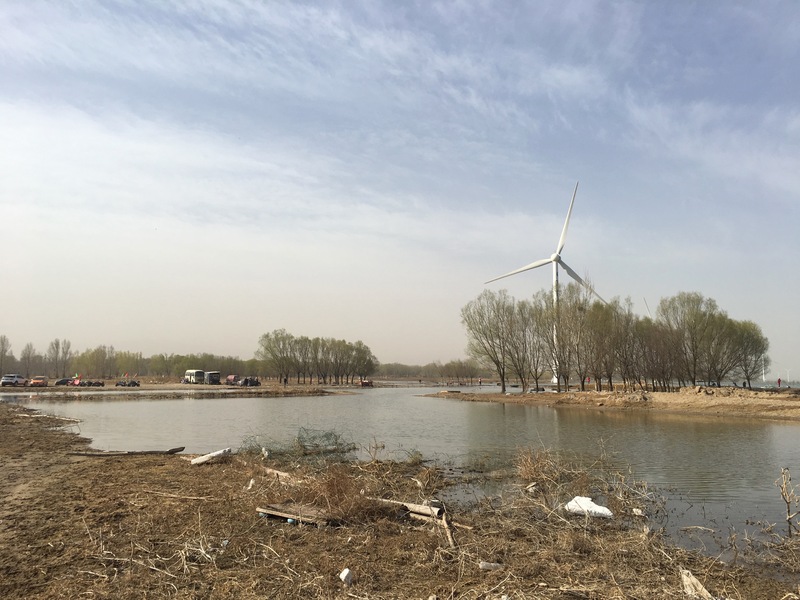 The Jianshangou Beds have yielded diverse fossil fish4, the birds Confuciusornis, Liaoningornis and Protarchaeopteryx, the theropod Sinosauropteryx, and diverse gastropods, bivalves, ostracods, conchostracans and insects. Age. The age of the Yixian Formation is equivocal. Vertebrate faunal correlation and previous radiometric dates4 suggest that the Jianshangou Beds are either of the latest Jurassic age, or near the Jurassic–Cretaceous transition. An Early Cretaceous age was also suggested by invertebrate faunal correlation, and supported by a recent radiometric date. According to our most recent field investigation, this date should be regarded as an upper age limit for the Jianshangou Beds. 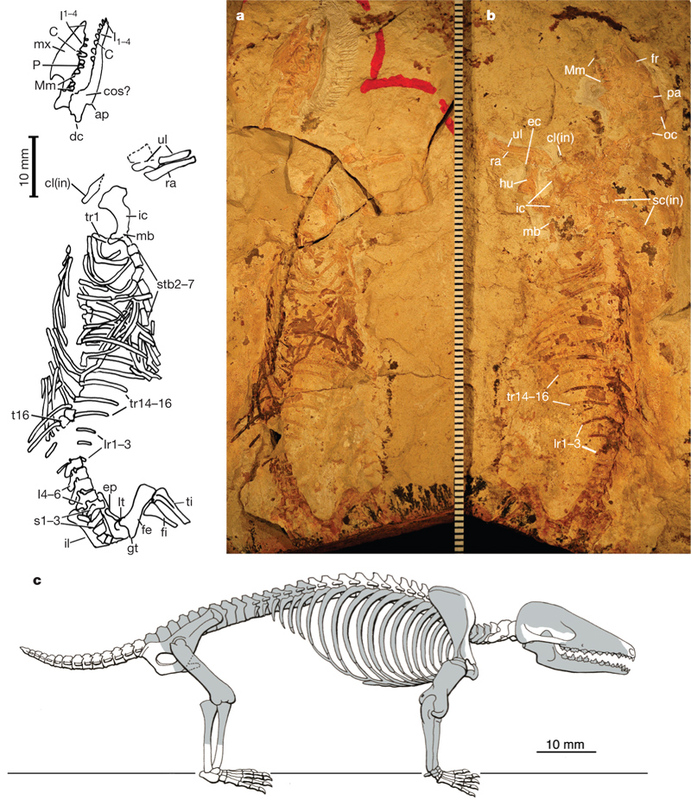 The nearly complete skeleton of Zhangheotherium quinquecuspidens has yielded new and more comprehensive anatomical information about the early therian mammals. New evidence on basicranial and postcranial anatomy from Zhangheotherium corroborates the hypothesis that symmetrodonts are a part of the basal therian radiation. 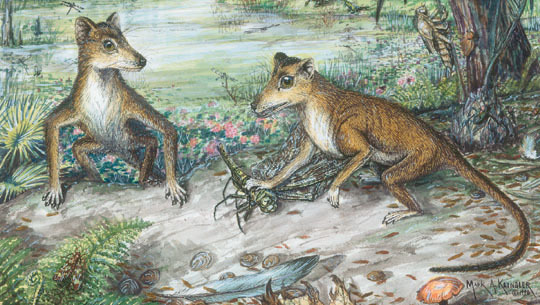 Postcranial features of this new therian mammal support a sister-group relationship between multitubercualtes and therian mammals. A mobile clavicle–interclavicle joint that allows a wide range of movement of the forelimb has an ancient origin in the mammalian phylogeny. The abducted forelimb inferred for Zhangheotherium and other archaic therians suggests that early therian mammals lacked the more parasagittal forelimb posture of most living therians. The presence of a finger-like promontorium in Zhangheotherium indicates, albeit indirectly, that an uncoiled cochlea was present in symmetrodonts and that the coiled cochlea was a development later in therian evolution. FIGURE 5. 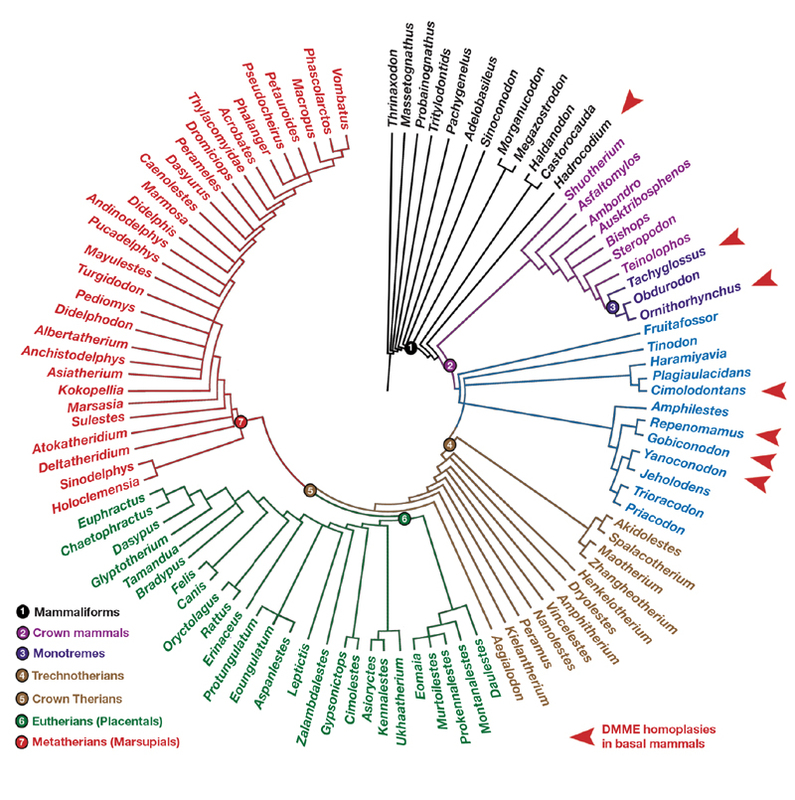 Phylogenetic relationships of Zhangheotherium quinquecuspidens. Hu, Y., Wang, Y., Luo, Z., and Li, C. 1997. A new symmetrodont mammal from China and its implications for mammalian evolution. Nature 390: 137–142. Hu, Y., Wang, Y., Li, C., and Luo, Z. 1998. 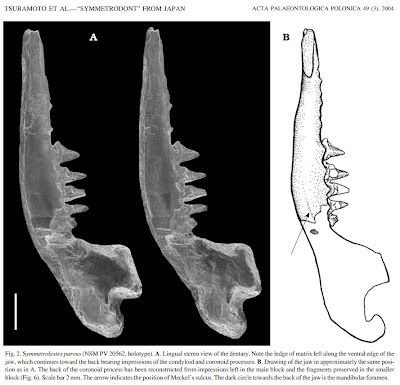 Morphology of dentition and forelimb of Zhangheotherium. Vertebrata PalAsiatica 36 (2): 102–125.